This 16" dia. 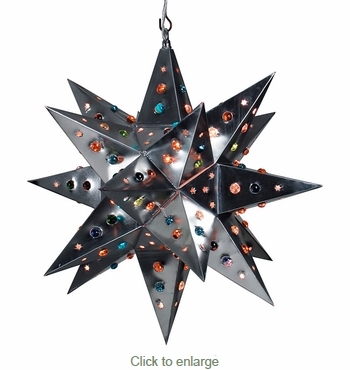 tin hanging star light with colored marbles will create an inviting glow to any southwest or Mexican style interior or exterior decor. Our natural tin star lights, or Moravian starlights, are handcrafted by artisans in Mexico. These natural tin decorative star fixtures complement any southwest, Mexican or rustic decor. Since each tin star light is hand crafted, color and finish may vary slightly from what's pictured here. Chain and ceiling plates sold separately.